I had to double-check the Equibase chart to make sure: Union Rags won his return race in the Fountain of Youth (G2) Sunday by four lengths. Surely the winning margin was wider than that. The post-race reaction from trainer Michael Matz, jockey Julien Leparoux, TV analyst and Hall of Fame jockey Gary Stevens, and scores of fans and handicappers indicated Union Rags had defeated his overmatched rivals by at least 10 lengths. Even watching the race in real-time it seemed to be at least a half dozen, but the replay reveals the chart to be true. This is what happens when the early Kentucky Derby favorite makes a flawless debut as a 3-year-old. Leparoux claims he was essentially along for the ride, never in doubt of the end result. “Push button” is a term we’ve somewhat recently used for Kentucky Derby winners Big Brown and Smarty Jones, and Union Rags truly seems to be in control of himself and ready to roll when it’s time. Sitting off pacesetter and surprising post-time favorite Discreet Dancer and two others, Union Rags simply waited for the far turn to make his sweeping move on the outside. Although Matz claimed he was never in full stride, the stride we saw down the stretch was jaw-dropping. Discreet Dancer was clearly no match and gave more fodder to the naysayers who questioned his distance capability. News Pending, a 27-1 longshot, was able to pass him for second place and will face the winner again in the Florida Derby (G1). Some will say aside from Union Rags, the Fountain of Youth field was weak. It’s hard to argue seeing as in their previous races, only one rival finished in the money of a non-restricted stakes. However, the fact Union Rags was coming in off a layoff, not 100% primed, and toyed with the field, all give reason enough to get excited of what could be. The biggest disappointment of the day no doubt came from the announcement of the scratch of Algorithms. It seems impossible to have a Kentucky Derby Trail without a questionable health situation for one of the favorites. Algorithms “popped a splint” and Pletcher has no timetable for his return to the track, although he hopes to have him back out soon. Saturday’s Risen Star Stakes (G2) featured a thrilling stretch duel between Mark Valeski and eventual winner El Padrino. The final time for the 1 1/16 mile contest was 1:42.96, less than a second off track record time. El Padrino was the short-priced favorite, and some think he should have won with more authority given the suspect field. However, I now consider Mark Valeski a serious contender based on the fact it was his stakes debut and he finished well clear of the rest of field by a 5 ½ length margin. Stablemate Mr. Bowling, winner of the Lecomte Stakes (G3), was a major disappointment on the other hand in the Risen Star. Trainer Larry Jones said there was no excuse for his last place finish. Back to the winner, you have to like El Padrino’s running style, willingness to battle, and versatility on different tracks and conditions. 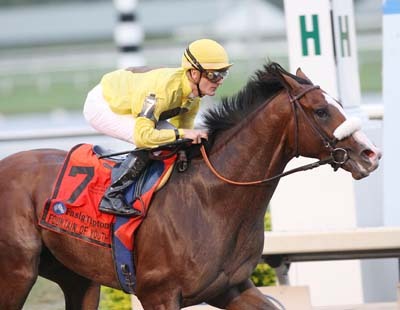 Trainer Todd Pletcher indicated the Louisiana Derby (G2) would be the next logical spot. Other notable wins over the weekend: Isn’t He Clever returned to the comforts of Sunland Park for a victory in the Borderland Derby; and The Lumber Guy easily won the Miracle Wood Stakes at Laurel Park in just his second race.